Aquarium & fish-keeping is an amazing hobby – being able to create communities, and beautiful environments is one of the best things about it, however… It can often get very confusing when you have to consider all the different plants, setups and everything. Low light aquariums are indeed beginner friendly but will teach you a lot when it comes to this hobby. If that’s the case, then – you’ve come to the right place. In this article, you will be learning a lot about low light aquarium plants, and for that reason, we’ve picked the best 17 plants you can get. So, let’s get into it! Sagittaria is a fantastic plant; it’s often recommended for beginners because it’s very undemanding and quite easy to maintain. It doesn’t require much light, so it’s perfectly suitable for low-light environments. Sagittaria is a grass-like, grounded plant that can grow quite a lot; it’ll serve quite well as a carpet for your aquarium. On top of that, it’s pretty great looking! Named after Indonesian island Java, this plant is quite versatile and popular within many aquariums. It’s very easy to maintain and spreads quickly like a weed if kept in right conditions. Java Fern is often placed on driftwood, rocks and will grow quite well attached to them. It can easily thrive in low light conditions, and it’s actually bothered by strong lights. On top of all that, it’s very beautiful and appealing and will look great in your aquarium. Stemming from areas of South East Asia, this plant is often confused with rotala rotundifolia, and while they may be similar, Rotala Indica performs better under low light conditions so let’s take a closer look at it. It has very appealing round-looking leaves that are green at the top and a little bit red/pinkish at the bottom. It’s relatively easy to take care off, so it’s quite beginner friendly. It’s often used as a middle ground plant for most aquariums. 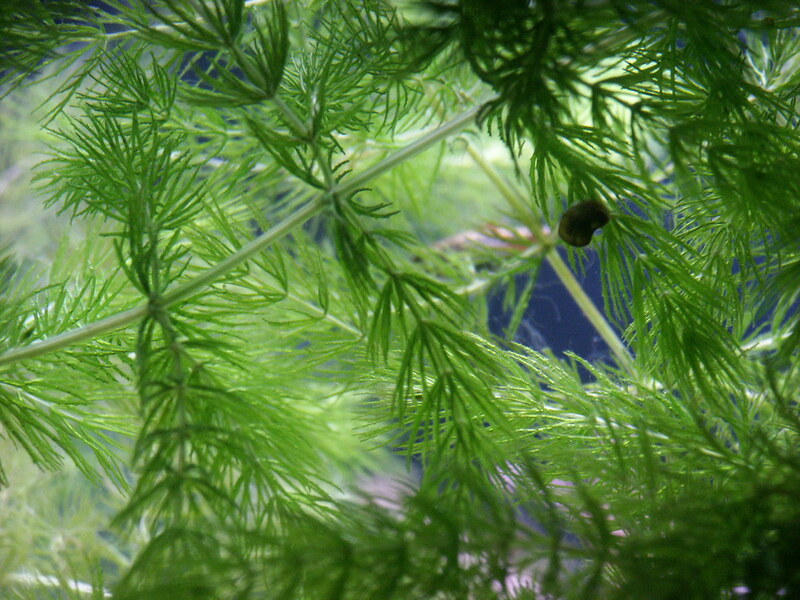 Also known as Coontail, Hornwort is a submerged, free-floating plant with no roots. It’s also very popular in aquariums as it’s quite easy to maintain and grows quickly. It grows faster with right lighting conditions, but it’s just fine under low light. Its appearance is very hair-like and hard, and it looks very good in most aquariums. Since it’s fast-growing and very bright green looking, it’ll look really good in dense aquarium environments. Anubias barteri is one of the most popular plants for beginners, and there are many reasons why. It’s easy to take care of, requires minimal light to thrive, has quite hard leaves so fish won’t eat it and on top of all that it’s very large and your fish will like to hide behind it. Anubias will add awesome bright looking green to your aquarium. Leaves may grow up to 12 inches, and they will look great in every aquarium. They’re semi-aquatic and usually attached to rocks or wood. Cons: In low light conditions: None! Java Moss is most commonly used in freshwater aquariums by being attached to rocks, roots, and driftwood. It’s perhaps the most popular aquarium moss and is very easy to maintain. It thrives in low lighting setups, grows rather fast and attaches to all surfaces which makes it the ideal moss for most aquariums. It’s mostly used for aquascaping (like gardening, but underwater!). It is a great addition to almost any tank, grows quite fast and can soften hard surfaces. Additionally, your fish will love to hide their eggs within it. Pros: It’s awesome! Easy to take care of, durable, easy to apply and looks great as a carpet. Cons: One problem with Java Moss might be algae growth, once attached it can be quite hard to get rid off. In order to keep it away, use low-light conditions and clean water. The queen of background plants – Vallisneria is one of the most popular plants if you’re looking to create awesome, dense and jungle-like environments. It’s one of the most commonly used plants, it’s straightforward to maintain, and it will grow up to great lengths to provide with that beautiful, luscious aquarium look. On top of all that, it loves low-light environments, so this is a must-have for you. The only problem you will have with this plant is that it will try to take over your whole aquarium with its rapid growth, so make sure you don’t let her! Your fish will also love to use it as a cover, so that’s a bonus. The Brazillian Pennywort aka water lily is very beginner-friendly, easy to grow plant that thrives in most waters and works well with low light conditions. It’s very unique looking and grows quite fast, sometimes even reaches the surface levels where it will produce small white flowers. It’s planted inside the substrate and very easy to maintain. It’s a very popular plant in most aquariums, and since it grows to surface levels, it can provide your inhabitants with a great place to catch a break and rest. Cryptocoryne Usteriana is one of those extremely large, background plants that prefer hard water conditions. It’s straightforward to grow, and it works well under most circumstances. The leaves are very large, 1.5-2 inch wide and can grow up to 20inches in length – This makes it quite unique and attractive. In combination with other plants, it will stand out quite a bit, and although it’s mostly green, it has few red shades over it which make it stand out. Dwarf hair grass is extremely popular for being a beginner friendly, easy to use “carpet” plant for most aquariums. It’s a unique grass-like look, and bright green colors make it a perfect plant for your aquarium’s foreground. It’s used mostly with soft substrates to decorate aquariums due to its unique look. Additionally, you can let it grow a little taller, and your fish will use it as cover because it’s a really good hiding plant when grown fully. It can be a great addition to low light “nocturnal” settings due to its bright colors and density. If you’re looking for a great “lawn,” which is a bit taller carpet, for your aquarium, it may be better to use mosses instead of these. Cons: It’s a bit harder to grow it in low-light environments but will definitely look great nontheless, you just won’t achieve very tall heights. Bacopa Caroliniana is a stem plant that comes straight from the United States, so it’s already entirely different compared to most of the plants that come from Asia. It’s very popular and easy to obtain and take care of. It’s a slow grower that doesn’t require much to be maintained, so it’s very suitable for beginners. Its leaves are quite bold and green/yellowish looking. It serves mostly as a background plant. Ahh, the great moss-balls! This is perhaps the most unique looking plant out there. It’s a dark green “ball” that will look great in the foreground of your aquarium. They’re quite goofy looking and prefer low light environments. It’s not a plant at all – It’s a form of green algae that disguises itself as a plant. It’s extremely easy to plant them, you just put them in the tank and let them find their place on the ground. On top of that, a lot of species love to play with Marimo so they will like you for bringing these cute little balls to their community. Pros: Beginner-friendly, unique looking and cute! Tank Requirements: Keep it low light and it’ll be just fine! Originating from South America, Echinodorus is a beautiful, lush looking plant that’s very popular within aquariums. It’s straightforward to take care of so beginners can feel free to experiment with it. Perhaps it’s most unique feature is those beautiful looking “sword-like” bright green leaves that grow up to 20 inches tall. They’re best used as background plants in larger aquariums but will look great almost everywhere. Those awesome leaves will look great from the outside and on top of that, your fish will love to use it as a cover. Tank Requirements: Standard, can thrive in low light but Echinodorus does require some supplementation in dense environments as it can get deficient in nutrients like Iron as stated above. Try using liquid plant fertilizer. The only thing you need to know about this plant… It’s carnivorous!! It actually eats small insects. Jokes aside, Utricularia Graminifolia is a pretty unique plant for many reasons. First off, it belongs to the bladderwort family, and all of them are carnivores who capture small insects with bladder-like traps (but don’t worry, it won’t eat your fish). Aside from that, It’s mostly used as a grass-like carpet for the foreground of aquariums. It’s Latin name roughly translates to “with grass-like leaves” which tells you why it’s used as a carpet. Graminifolia is known to be quite a difficult plant to grow, so it may not be the best idea to use it as a beginner. The reason for that is because it requires special care to grow fully. However, it’s still very adaptable and will survive most conditions including low light setting although it will not develop fully. Pros: Great for “grass-like” carpets in the foreground and it’s awesome because it eats other creatures! Tank Requirement: As stated earlier, this plant will grow in most environments and in most conditions, however in order to grow it fully, it requires a little brighter setting, soft, acidic water (pH 6.5), colder temperatures between 65 to 77°F and additional CO2 supplementation. Fertiilization is also required. Moneywort is another very popular plant within aquariums, and it’s great for beginners. It’s relatively easy to grow and doesn’t require any special requirements. The leaves are oblong, thick, light-green, almost lime-like colors which make it pretty attractive and stunning plant within most aquariums. They grow quite large and will reach surface levels if left untrimmed. Due to its unique look, it serves as a great addition to mid/background for almost any aquarium. Are you tired of all the green plants and perhaps looking for something different? Worry not, Ludwigia palustris is here to save the day. This beautiful, beginner friendly plant is a very great option if you want to add some vivid colors to your aquarium. It has oval leaves that grow along a tilted stem, leaves are usually red/pink but can sometimes be orange or gold depending on the conditions. This plant requires little to no light and grows up to 12 inches so it could be a great fit for your aquarium. Its unique red color makes it awesome to use as a foreground plant to be displayed as best as possible. So, you’re finally at the end of this long journey! You can’t say it wasn’t worth it, though. You’ve learned a lot about all the different kinds of plants that you can use for your low light aquarium. These 17 plants will be everything you need to create that amazing community & environment, so don’t wait any longer – go ahead and pick them up, experiment with them and report back with those beautiful aquarium shots.